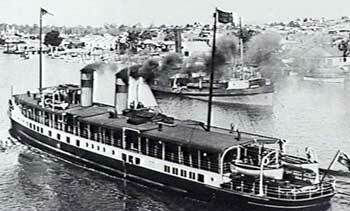 The passenger ferry Koopa had operated since before World War II in Moreton Bay, Queensland, running pleasure cruises. On 10 August 1942 the vessel was requisitioned for naval service. She commissioned at Brisbane on 14 September 1942 under the command of Lieutenant Commander George WT Armitage, RAN (Emergency List). After returning to Brisbane in February 1945 she was handed over to the Royal Navy on 26 July 1945 as a floating source of steam and electrical power. Koopa reverted to the RAN on 24 September 1945 and was returned to her owners, Brisbane Tug and Steamship Company Ltd, on 10 January 1947. 'Fairmile Ships of the Royal Australian Navy' edited by and written by Peter Evans & Richard Thompson - published by Australian Military History Publications, Loftus, 2005.